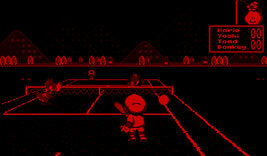 Mario and friends take to the tennis courts. The aim is to hit the ball onto the opponent's side of the court, and past them to score. You must also hit the ball back if it is hit onto your side to avoid losing. The 3D effect gives the court depth, but the characters are flat cartoons. You have to play through a tournament of characters to win.